Behind every modern tale of cosmological discovery is the supercomputer that made it possible. Such was the case with the announcement yesterday from the European Space Agencies’ Planck mission team which raised the age estimate for the universe to 13.82 billion years and tweaked the parameters for the amounts dark matter, dark energy and plain old baryonic matter in the universe. Planck built upon our understanding of the early universe by providing us the most detailed picture yet of the cosmic microwave background (CMB), the “fossil relic” of the Big Bang first discovered by Penzias & Wilson in 1965. 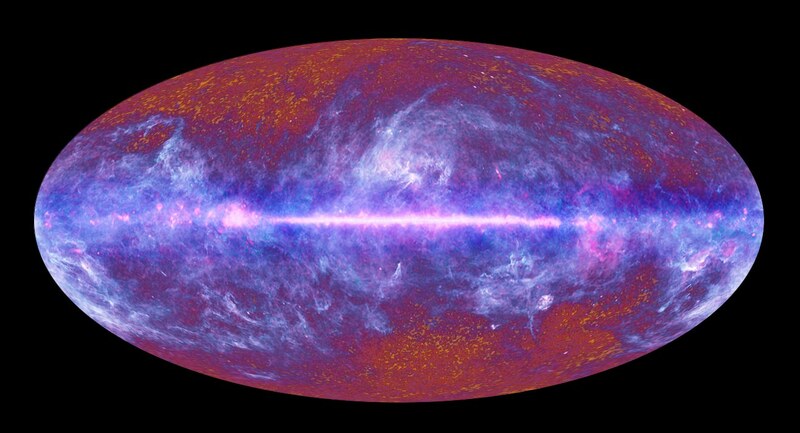 Planck’s discoveries built upon the CMB map of the universe observed by the Wilkinson Microwave Anisotropy Probe (WMAP) and serves to further validate the Big Bang theory of cosmology. But studying the tiny fluctuations in the faint cosmic microwave background isn’t easy, and that’s where Hopper comes in. From its L2 Lagrange vantage point beyond Earth’s Moon, Planck’s 72 onboard detectors observe the sky at 9 separate frequencies, completing a full scan of the sky every six months. This first release of data is the culmination of 15 months worth of observations representing close to a trillion overall samples. Planck records on average of 10,000 samples every second and scans every point in the sky about 1,000 times. That’s a challenge to analyze, even for a supercomputer. Hopper is a Cray XE6 supercomputer based at the Department of Energy’s National Energy Research Scientific Computing center (NERSC) at the Lawrence Berkeley National Laboratory in California. Named after computer scientist and pioneer Grace Hopper, the supercomputer has a whopping 217 terabytes of memory running across 153,216 computer cores with a peak performance of 1.28 petaflops a second. Hopper placed number five on a November 2010 list of the world’s top supercomputers. (The Tianhe-1A supercomputer at the National Supercomputing Center in Tianjin China was number one at a peak performance of 4.7 petaflops per second). One of the main challenges for the team sifting through the flood of CMB data generated by Planck was to filter out the “noise” and bias from the detectors themselves. “It’s like more than just bugs on a windshield that we want to remove to see the light, but a storm of bugs all around us in every direction,” said Planck project scientist Charles Lawrence. To overcome this, Hopper runs simulations of how the sky would appear to Planck under different conditions and compares these simulations against observations to tease out data. “By scaling up to tens of thousands of processors, we’ve reduced the time it takes to run these calculations from an impossible 1,000 years to a few weeks,” said Berkeley lab and Planck scientist Ted Kisner. But the Planck mission isn’t the only data that Hopper is involved with. Hopper and NERSC were also involved with last year’s discovery of the final neutrino mixing angle. Hopper is also currently involved with studying wave-plasma interactions, fusion plasmas and more. You can see the projects that NERSC computers are tasked with currently on their site along with CPU core hours used in real time. Maybe a future descendant of Hopper could give Deep Thought of Hitchhiker’s Guide to the Galaxy fame competition in solving the answer to Life, the Universe, and Everything. Also, a big congrats to Planck and NERSC researchers. Yesterday was a great day to be a cosmologist. At very least, perhaps folks won’t continue to confuse the field with cosmetology… trust us, you don’t want a cosmologist styling your hair! After two and a half years of observing the Cosmic Microwave Background, the ESA Planck spacecraft’s High Frequency Instrument ran out of its on-board coolant gases over this past weekend, reaching the end of its very successful mission. But that doesn’t mean the end for Planck observations. The Low Frequency Instrument, which does not need to be super-cold (but is still at a bone-chilling -255 C), will continue taking data. From its location at the Earth/Sun’s L2 Lagrangian point, Planck was designed to ‘see’ the microwaves from the CMB and detects them by measuring temperature. The expansion of the Universe means that the CMB is brightest when seen in microwave light, with wavelengths between 100 and 10,000 times longer than visible light. To measure such long wavelengths Planck’s detectors have to be cooled to very low temperatures. The colder the spacecraft, the lower the temperatures the spacecraft can detect. The High Frequency Instrument (HFI) was cooled to as close to 2.7K (about –270°C, near absolute zero) as possible. Planck worked perfectly for 30 months, about twice the span originally required, and completed five full-sky surveys with both instruments. “Planck has been a wonderful mission; spacecraft and instruments have been performing outstandingly well, creating a treasure trove of scientific data for us to work with,” said Jan Tauber, ESA’s Planck Project Scientist. While it was the combination of both instruments that made Planck so powerful, there is still work for the LFI to do. The scientists involved in Planck have been busy understanding and analyzing the data since Planck launched in May 2009. Initial results from Planck were announced last year, and with Planck data, scientists have created a map of the CMB identifying which bits of the map are showing light from the early Universe, and which parts are due to much closer objects, such as gas and dust in our galaxy, or light from other galaxies. The scientists have also produced a catalog of galaxy clusters in the distant Universe — many of which had not been seen before — and included some gigantic ‘superclusters,’ which are probably merging clusters. The scientists expect to release data about star formation later next month, and reveal cosmological findings from the Big Bang and the very early Universe in 2013. Scanning the sky in microwaves, the Planck mission has obtained its very first images of galaxy clusters, and found a previously unknown supercluster which is among one of the largest objects in the Universe. The supercluster is having an effect on the Cosmic Microwave Background, and the observed distortions of the CMB spectrum are used to detect the density perturbations of the universe, using what is called the Sunyaev–Zel’dovich effect (SZE). This is the first time that a supercluster has been discovered using the SZE. In a collaborative effort, the XMM Newton spacecraft has confirmed the find in X-rays. Sunyaev-Zel’dovich Effect (SZE) effect describes the change of energy experienced by CMB photons when they encounter a galaxy cluster as they travel towards us, in the process imprinting a distinctive signature on the CMB itself. The SZE represents a unique tool to detect galaxy clusters, even at high redshift. Planck is able to look across nine different microwave frequencies (from 30 to 857 GHz) to remove all sources of contamination from the CMB, and over time, will provide what is hoped to be the sharpest image of the early Universe ever. Since the hot electrons in the cluster are much more energetic than the CMB photons, interactions between the two typically result in the photons being scattered to higher energies. This means that, when looking at the CMB in the direction of a galaxy cluster, a deficit of low-energy photons and a surplus of more energetic ones is observed. The SZE signal from the newly discovered supercluster arises from the sum of the signal from the three individual clusters, with a possible additional contribution from an inter-cluster filamentary structure. This provides important clues about the distribution of gas on very large scales which is, in turn, crucial also for tracing the underlying distribution of dark matter. “The XMM-Newton observations have shown that one of the candidate clusters is in fact a supercluster composed of at least three individual, massive clusters of galaxies, which Planck alone could not have resolved,” said Monique Arnaud, who leads the Planck group following up sources with XMM-Newton. Superclusters are large assemblies of galaxy groups and clusters, located at the intersections of sheets and filaments in the wispy cosmic web. As clusters and superclusters trace the distribution of both luminous and dark matter throughout the Universe, their observation is crucial to probe how cosmic structures formed and evolved. The first Planck all-sky survey began in mid-August 2009 and was completed in June 2010. Planck will continue to gather data until the end of 2011, during which time it will complete over four all-sky scans. The Planck team is currently analyzing the data from the first all-sky survey to identify both known and new galaxy clusters for the early Sunyaev-Zel’dovich catalogue, which will be released in January of 2011. After a year of observations, the Planck observatory team released an all-sky microwave image, and what a gorgeous image it is! The Planck satellite looks at the entire sky in the microwave region of the electromagnetic spectrum, (30 to 857 GHz) with the main goal of tracking down the echoes of the Big Bang, the Cosmic Microwave Background (CMB.) This new image reveals the cosmic signal is literally hidden behind a fog of foreground emission, arising mostly from the interstellar medium (ISM), the diffuse mixture of gas and dust filling our Galaxy. At the top and bottom of the image in the red and yellow marbled region is where the CMB is visible. “By contrast, a good part of the sky is dominated by the Milky Way contribution, shining strongly along the Galactic Plane but also extending well above and below it, albeit at a very much lower intensity,” said Jan Tauber, Planck Project Scientist. To produce this image, the Planck team combined data from the full frequency range of Planck. The main disc of our Galaxy runs across the center of the image, with streamers of cold dust reaching above and below the Milky Way. This galactic web is where new stars are being formed, and Planck has found many locations where individual stars are edging toward birth or just beginning their cycle of development. To get your bearings of where everything is locatated, here is an annotated version. 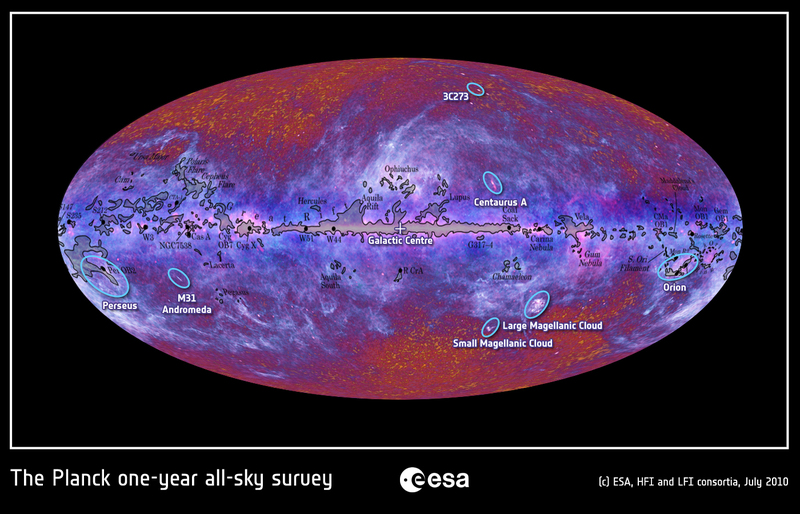 Annotated version of the Planck all-sky image. Credit: ESA, HFI and LFI consortia. And this is just the beginning of beautiful things from Planck! Planck all-sky annotated image. Credit: ESA, HFI and LFI consortia. For more info see this ESA webpage, and the Planck website.